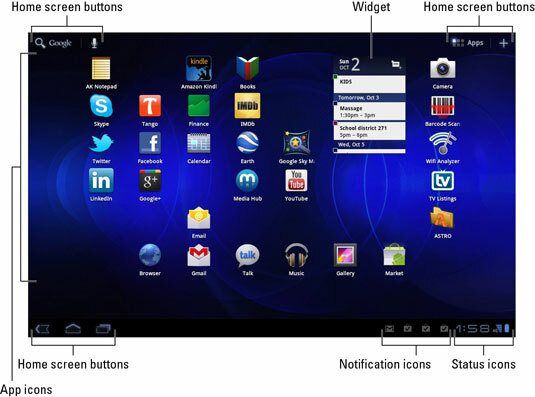 The main base from which you begin exploration of the Galaxy Tab is the Home screen. It’s the first thing you see after unlocking the Tab, and the place you go to whenever you quit an application. The Home screen is more than what you see. It’s actually an entire street of Home screens, with only one Home screen panel displayed at a time. To switch from one panel to another, swipe the Home screen left or right. There are two panels to the left of the main Home screen panel, and two panels to the right. When you touch the Home icon button, you’re returned to the last Home screen panel you viewed. To return to the main, center Home screen panel, touch the Home icon button a second time. Home screen buttons: Special symbols are found on three corners of the Home screen, as well as in quite a few apps. The symbols identify buttons you touch to activate common Galaxy Tab features. Notification icons: These icons come and go, depending on what happens in your digital life. For example, new icons appear whenever you receive a new e-mail message or have a pending appointment. Status icons: These icons represent the Tab’s current condition, such as the type of network it’s connected to, signal strength, and battery status, as well as whether the Tab is connected to a Wi-Fi network or using Bluetooth, for example. App icons: The meat of the meal on the Home screen plate is where the action takes place: app (application) icons. Touching an icon runs its program. Widgets: A widget is a teensy program that can display information, let you control the Tab, access features, or do something purely amusing. The Home screen is entirely customizable. You can add and remove icons from the Home screen, add widgets and shortcuts, and even change wallpaper (background) images. When you rotate the Galaxy Tab, the Home screen changes its orientation to match. The horizontal Home screen features all the same gizmos as the vertical Home screen, but because of the narrow width, many of the items shuffle around. Touching a part of the Home screen that doesn’t feature an icon or a control does nothing. That is, unless you’re using the live wallpaper feature. In that case, touching the screen changes the wallpaper in some way, depending on the wallpaper that’s selected..